Vigan-Womas, I., Guillotte-Blisnick, M. and Mercereau-Puijalon, O. (2013). Plasmodium falciparum Rosette Formation Assay. Bio-protocol 3(8): e412. DOI: 10.21769/BioProtoc.412. Vigan-Womas, I., Guillotte, M., Juillerat, A., Hessel, A., Raynal, B., England, P., Cohen, J. H., Bertrand, O., Peyrard, T., Bentley, G. A., Lewit-Bentley, A. and Mercereau-Puijalon, O. (2012). Structural basis for the ABO blood-group dependence of Plasmodium falciparum rosetting. 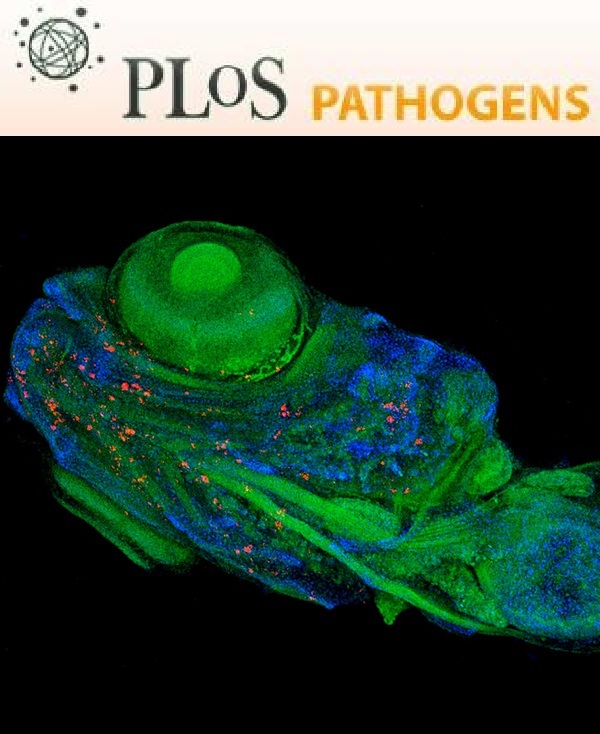 PLoS Pathog 8(7): e1002781. Rosetting, i.e. the capacity of red blood cells (iRBCs) infected with mature parasite stages to bind two or more uninfected red blood cells (RBCs) is a virulence factor of Plasmodium falciparum. This protocol describes an in vitro assay to monitor rosette formation by P. falciparum-infected red blood cells, including procedures for rosette enrichment, maintenance of rosetting phenotype and assays for rosetting with RBC labeled using lipophilic fluorescent probes. Fresh human red blood cells (RBCs) collected on anticoagulant, preferably citrate-phosphate-dextrose (CPD). Avoid use of heparin, as most rosettes are heparin-sensitive. If fresh RBCs (collected during the previous 24 h) are not available, use a sample stored for less than 2 weeks at 4 °C. Use disposable professional gloves throughout. For all details concerning the general method for in vitro culture of P. falciparum blood stage parasites and assessment of parasitaemia by blood smear see (Moll et al., 2008a; Alexander et al., 2012). Cultivate Plasmodium falciparum parasites in fresh human O+ or A+ erythrocytes at 5% haematocrit, in CCM (see recipes section), under continuous gazing (5% O2, 5% CO2 and 90% N2) at 37 °C. The gas mixture may also be introduced by blowing gas for 20 sec in the culture flask. Close the flask tightly thereafter. The Palo Alto 89F5 VarO, IT4/R29, 3D7/PF13 or IT4/FCR3S1.2 rosette-forming clones can be used as positive controls, as they have a high proportion of rosette-forming parasites. Note that the percentage of rosette-forming parasites in clinical samples is quite variable. Change medium every day: The flask is gently put under the laminar flow safety cabinet avoiding disturbing the sedimented red blood cells, after 15 min, the medium (supernatant) is carefully aspirated with a sterile disposable serological 1 ml aspiration pipette (devoid of cotton plug) connected to a vacuum pump. Count parasitemia daily. Prepare a blood smear and fix the cells by pouring pure methanol onto the slide.– Important note: Handle methanol under a chemistry hood, collect waste store it under a chemistry hood and use ad-hoc waste disposal circuit. Prepare a Giemsa-stained smear of methanol-fixed red cells by immersing the slide in a 5% Giemsa solution in buffer pH 7.2 prepared with 1 tablet of buffer Merck 1.09468.0100 in 1 L sterile distilled water. Stain for 10 min at room temperature. Rinse with buffer and examine under a microscope. Note: Rosette formation is dependent on human serum components - practically speaking presence of human serum is needed to form rosettes. For each rosetting line or isolate, the exact concentration of serum needed should be determined. Usually, it is above 5%. Some commercial serum batches do not sustain rosette formation. Test the batch of sera with positive control lines, such as Palo Alto 89F5 VarO, IT4/R29, 3D7/PF13 (Vigan-Womas et al., 2011) or IT4/FCR3S1.2. Centrifugation on ice-cold Ficoll enriches for rosette-forming iRBCs and mitigates the progressive loss of the phenotype resulting from antigenic variation. It can be done with cultures of rosetting parasites (e.g. Palo Alto 89F5 VarO, IT4/R29, 3D7/PF13 or FCR3S1.2) or used to enrich for rosette-forming iRBCs from unselected lines or clinical samples. Starting from a standard (unselected) long-term in vitro P. falciparum culture in which no or few rosettes are initially detected, enrichment twice to three times a week during successive 8-12 weeks allows progressive increase of the rosetting rate to approx. 10% (Vigan-Womas et al., 2011). Harvest in vitro culture at mature stages (trophozoite - young schizont stages, 5 to 8% parasitaemia) in a conical Falcon centrifugation tube. Centrifuge the culture, 10 min at 256 x g (1,200 rpm) in the Fisher Scientific Heraeus Multifuge at room temperature. Resuspend the pellet in prewarmed (37 °C) CCM, e.g. add 11 ml CCM to 1 ml pellet. Dispense 2 ml ice-cold Ficoll in a 5 ml polystyrene round-bottom sterile tube (prepare six tubes for 1 ml cell pellet). Carefully overlay 2 ml RBC suspension (step d) on top of the Ficoll (step e). Centrifuge immediately in an Eppendorf Centrifuge 5702 for 30 sec, at 900 x g (2,400 rpm), room temperature. Do not use brake to decelerate. Rosette-forming parasites sediment with uninfected RBCs in the small pellet at the bottom of the tube. Quickly aspirate the supernatant using a 1 ml aspiration sterile pipette connected to a vacuum pump. Resuspend and pool the 6 pellets containing rosette-forming parasites in 4 ml prewarmed CCM. Check the rosetting rate (see 3). Repeat the procedure routinely twice a week. In a 1.4 ml matrix round bottom tube, add 100 μl of CCM containing 10 μg/ml Hoechst 33342 and 1-2 μl of cell pellet under study. Mix gently and incubate for 10 min at 37 °C in the dark. Centrifuge 3 min at 256 x g (1,200 rpm), room temperature in the Fisher Scientific Heraeus Multifuge. Remove the supernatant and resuspend the pellet in 40 μl prewarmed CCM. Place a 10 μl parasite suspension onto a microscope glass slide and cover with a coverslip. Examine the sample under the microscope using a 40x or 100x objective. In case of Hoechst 33342-stained samples, use a fluorescence microscope and use both UV and bright-field light to visualise both iRBCs and RBC (Figure 1). Figure 1. Visualisation of rosettes after enrichment on Ice-cold Ficoll. A. Light microscopy. B. UV and light microscopy of Hoechst 33342-stained preparations. C. Giemsa stained smear. Count 100-200 iRBCs and score the number of iRBCs engaged in rosettes (i.e. trophozoite or schizont stages having bound two or more uninfected RBC). Calculate the rosetting rate = (No. mature stage iRBC engaged in rosettes/No. mature stages) x 100. Selection of mature iRBCs (trophozoites to schizont) by using magnetic cell sorting (MACS). Harvest in vitro culture of rosettes forming parasites at mature trophozoite to schizont stages. Enrich for rosettes on ice-cold Ficoll (as described in section 2). Prepare 10 μg/ml heparin or dextran sulphate in CCM and add 5 ml to the cell preparation to dissociate rosettes. Incubate 30 min at 37 °C (use an incubator with continuous gazing rather than water-bath). Check that all rosettes are disrupted by microscopic examination of an aliquot (see section 3). Place a CS column in the magnetic field of the VarioMACS magnetic separator and fill the column with 10 μg/ml heparin or dextran sulphate in CCM. Load the rosette-disrupted suspension on the column. Haemozoin-containing mature trophozoite and schizont stages are retained by the magnetic field. Wash twice the column with 10 ml 10 μg/ml heparin or dextran sulphate in CCM. Disconnect the column from the magnetic field and put it onto a 15 ml Falcon conical tube. Add 10 ml 10 μg/ml Heparin or Dextran sulphate in CCM on top of the column. Elute the retained iRBCs by flushing out the column using a 10 ml syringe filled with air. Centrifuge 10 min, 256 x g (1,200 rpm) in the Fisher Scientific Heraeus Multifuge at room temperature. Wash twice the pellet with RPMI medium supplemented with 1-2% Human AB+ serum (serum needed to avoid agglutination of iRBCs). Resuspend the pellet at 2% haematocrit in RPMI medium supplemented with 1-2% Human AB+ serum. Check parasitaemia of the purified iRBCs using a Giemsa-stained smear. The percentage of iRBCs should be > 90%. For additional experimental details concerning MACS purification of iRBCs with mature P. falciparum stages see (Moll et al. 2008b). Analysis of rosette-forming iRBC preference can be done by incubating various ratios of differentially labeled uninfected RBCs with iRBCs obtained from dissociated rosettes and concentrated by magnetic cell sorting (MACS) (Vigan-Womas et al., 2012). Place approximately 5 x 107 RBCs (i.e. 50 μl pelleted red cells or 500 μl red cells at 10% haematocrit in RPMI or CCM) in a 15 ml conical bottom polypropylene centrifuge tube. Add 5 ml RPMI 1640 medium (without serum). Centrifuge at 256 x g (1,200 rpm) in the Fisher Scientific Heraeus Multifuge, 5-10 min, room temperature. Carefully aspirate the supernatant, leaving no more than 25 μl supernatant on top of the pellet. Prepare a 1 μM PKH solution in diluent C provided by the manufacturer. Resuspend the RBC pellet in 500 μl diluent C by pipetting (do no vortex). Add 500 μl 1 μM PKH and immediately mix the sample by pipetting. Incubate 3 min at room temperature. Periodically invert the tube gently. Add 1 ml foetal bovine serum to stop the staining. Mix gently by inversion and incubate 1 min at room temperature. Centrifuge at 256 x g (1,200 rpm) in the Fisher Scientific Heraeus Multifuge, 10 min, room temperature. Remove the supernatant and transfer the cell pellet in a new 15 ml conical tube. Wash twice with 10 ml CCM followed by centrifugation at 256 x g (1,200 rpm) in the Fisher Scientific Heraeus Multifuge, 10 min, room temperature. Resuspend the cell pellet at 2% haematocrit in RPMI medium, supplemented with 1-2% Human AB+ serum. Examine cell staining using fluorescence microscopy. Use the procedure described in section 4 to obtain a pure (or highly enriched) preparation of iRBCs from rosetting parasites. Label iRBCs with 10 μg/ml Hoechst 33342 (see section 3). Dispense 40 μl iRBCs aliquots in 1.4 matrix round bottom tubes. Centrifuge at 178 x g (1,000 rpm) in the Fisher Scientific Heraeus Multifuge, 5 min, at room temperature and aspirate the supernatant. Prepare tubes containing varying ratios of PKH 67- or PKH26-labeled RBCs in RPMI medium with 1-2% Human AB+ serum (see section 5-a). Add 100 μl PKH 67- or PKH26-labeled RBCs to iRBCs pellet from step v.
Mix and wash twice the RBC/iRBC suspension with 900 μl CCM followed by centrifugation 5 min at 178 x g (1,000 rpm) in the Fisher Scientific Heraeus Multifuge, room temperature. Resuspend the RBC/iRBC pellet in 200 μl CCM. Incubate for 1 h, at 37 °C (use an incubator rather than water-bath). Discard the supernatant and resuspend the pellet in 40 μl CCM. Place a 10 μl suspension onto a microscope glass slide and cover with a coverslip. Count the percentage of rosettes using a fluorescence microscope. Record the number of PKH 67- or PKH26-labeled RBCs engaged in rosettes (Figure 2). This protocol was adapted from the following publications: Vigan-Womas et al. (2011) and Vigan-Womas et al. (2012). This work was supported by the Agence Nationale de la Recherche, contract ANR-07-MIME-021-0 (www.agence-nationale-recherche.fr/), and the 7th European Framework Program, FP7/2007-2013, (http://cordis.europa.eu/fp7/home_en.html) contract 242095, Evimalar. Kirsten, M., Inger, L., Hedvig, P., Artur, S., Mats, W. (2008a) Methods in Malaria Research, MRA/ ATCC and BioMalPar. Fifth Edition, section I, p. 4-7. Kirsten, M., Inger, L., Hedvig, P., Artur, S., Mats, W. (2008b) Methods in Malaria Research, MRA/ ATCC and BioMalPar. Fifth Edition, section IV p 31-44. Kirsten, M., Inger, L., Hedvig, P., Artur, S., Mats, W. (2008b) Methods in Malaria Research, Fifth Edition, section IV p 31-44, MRA/ ATCC and BioMalPar (www.biomalpar.org/updatedMethods_In_Malaria_Research_5thedition.pdf). Maier, A. G. and Rug, M. (2013). In vitro Culturing Plasmodium falciparum Erythrocytic Stages. Methods Mol Biol 923: 3-15. Vigan-Womas, I., Guillotte, M., Juillerat, A., Vallieres, C., Lewit-Bentley, A., Tall, A., Baril, L., Bentley, G. A. and Mercereau-Puijalon, O. (2011). Allelic diversity of the Plasmodium falciparum erythrocyte membrane protein 1 entails variant-specific red cell surface epitopes. PLoS One 6(1): e16544.